Is First REIT a 7.3% High Dividend Yield Opportunity or Should you be Careful? I used to write in the past that First REIT is one of those good REIT that investors should investigate why it is so good. It was one of the examples that I used to explain what experienced real estate investors look for when selecting the properties to put their money into. The price was pretty fair at 6% dividend yield not too long ago but in recent times the share price have fallen. Per my Dividend Stock Tracker, we can see the dividend yield is 7.3%. Now that to me is attractive territory, not because of the yield alone. When you evaluate a stock, you got to take in the whole package, whether the business has quality or there are some aspect that is negative such that it trades at this valuation. And for First REIT there is definitely some overhang. It would seem on the surface that ownership have changed but it will still remain in the Indonesian owner’s hands. If you add this with the rights issue to acquire OUE Downtown by OUE Commercial REIT, then what these transactions do is that they seem to be indirectly funding Lippo Karawachi. Lippo Karawachi is the parent of First REIT, a developer who is also the largest owner and operator of private hospitals in Indonesia. The tenants of First REIT’s Siloam hospitals is Lippo Karawachi. First REIT have various 15 year triple net master lease with Lippo Karawachi. These are very solid lease with a possibility to extend it for 15 more years. When each master lease is signed, Lippo agrees to pay First REIT shareholders in SGD at an exchange rate pegged at the start of the lease. This means that First REIT shareholders do not suffer from the brunt of currency fluctuations over the years, compared to REITs with properties paying foreign currency rental. The closest example is how the weakening Rupiah partly killed Lippo Malls Indonesia. But there is always a cost to these currency fluctuations. It is who will bare the cost. In this case, this currency cost is borne by Lippo Karawachi. Per a report on Siloam hospitals, it shows the amount of cost these rentals are to the hospitals. The model continue to work if the cost of rental is a manageable portion of the bottom line. 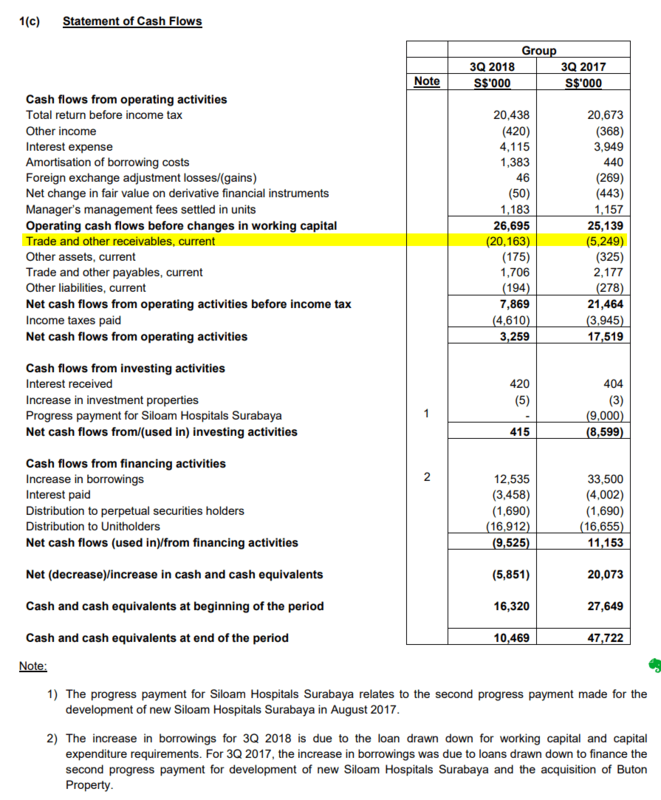 However, this is a difficult judge because Siloam Hospitals have frequently shown to have negative free cash flow. This is due to the aggressive model of plowing cash flow back into the business. So given the recent deals happening and this information, are there any cause of concern? First REIT announced their Q3 Results yesterday it does show some cause of concern. 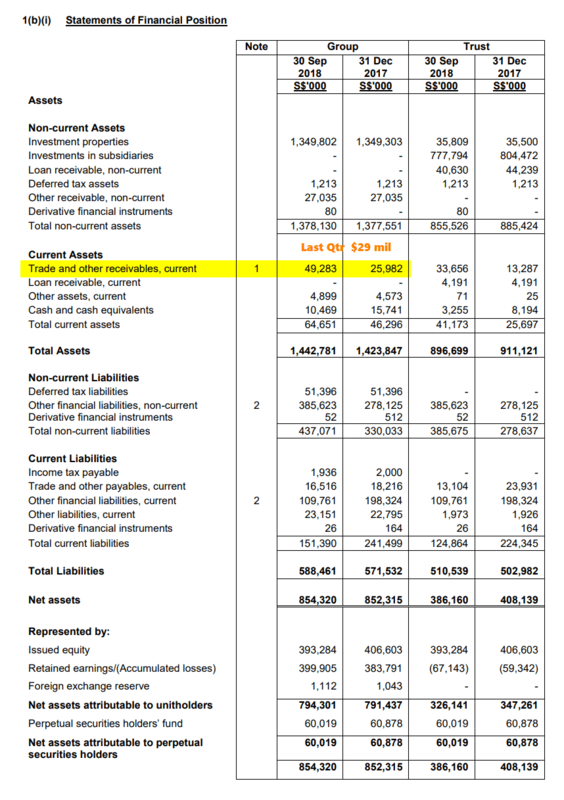 The above shows the third quarter cash flow statement. We can see a marked rise in the about of trade receivables. In the balance sheet, we can also observe a market rise in the trade receivables. First REIT did put out that YESTERDAY they received the rental payments amounting to S$17.5 mil. That was late. To be fair this was not the first time this was brought to my attention. Some web blog, which I cannot remember also wrote about the increase in receivables. Lippo Karawaci’s offshore bonds sold off after Indonesia’s anti-corruption agency, Komisi Pemberantasan Korupsi, said that company officials had been detained in connection with an alleged bribery case. The KPK said on Monday that a Lippo Group official had been charged in connection the alleged payment of bribes to government officials to procure permits for the company’s Meikarta township project in Bekasi. Lippo Karawaci’s dollar bonds due 2026 fell 3.3 points today to a cash price of 66.8, implying a yield of 13.7%, according to Tradeweb. CreditSights said the matter raised red flags about the company’s corporate governance, and came soon after Lippo Karawaci failed to file its financial results on time. Perhaps this is a reason why the share price fell from $1.30 to $1.18. The recent weakness in the REIT market certainly contributed to part of this. How should you read this? We go back to my article on why these triple net lease properties are solid. A lot of the times, they are solid because the property are solid and the tenants are solid. The tenants is probably a large part of the valuation and their robustness ties to everything. In this case, the uncertainty of the tenant have impacted the sturdiness of the REIT. Do Like Me on Facebook. I share some tidbits that is not on the blog post there often. Thank you so much for your analysis on First REITs, and though I don’t fully understood/look into these things when researching, it sure has definitely helped to open my eyes and learn more, so thank you!! Just wondering though, in a nutshell, is it basically that Lippo is bearing all the currency fluctuations, and with Siloam Hospitals rents increasing (in RP), this creates more “tough times” for the hospital? They also made payment pretty late.. which might prove to be an issue later on as well (unable to pay on time). Also considering that Lippo is having some unsettling news, it creates more uncertainty on what’s gonna happen to them in the near future. One thing I’m curious though which I read around as well, do you think that with OUE coming in to the picture, would it serve as a cushion to help Lippo with their cash flow? My apologies for being so long-winded, still learning on picking up all these details to better analyse a business! Thank you! Hi Bjorn, when good opportunity is there it always look uncertain but they are uncertain for a good reason because every chance this could end up as a dud. Thanks! I am so busy that don’t have time to monitor this counter and puzzling why it dropped. Thanks for your article. Siloam hospital is 51% owned by Lippo karawaci and doesn’t have much debt. The other major shareholder is a private equity. The screenshot of your Citi report seems to imply that siloam pays the leases, whereas you were saying Lippo karawaci pays the leases (which is why you were concerned). Would it matter to you if it’s the debt free subsidiary paying the leases? Would you free more comfortable now that oue is taking over? Hi Ken, thanks for correcting me. Siloam is net cash, and it is the parent who is the pay master. The two paragraphs shows the level of cost to Siloam. What was not shown is the increase in rent lippo paid first reit. I think it wouldn’t matter in this case if the debt free subsidiary is paying the leases. I think the relationship with OUE will be something new to deal with. The one thing that was working for first reit is the Siloam hospital model. Any health care assets that they have before that is non Siloam didn’t work for them. Yep you are right that Lippo Karawaci pays First REIT for the leases, the revenue for First REIT would be approximately the cost of rental for Lippo Karawaci. Last year, First REIT received about IDR 1 trillion of rental income from Indonesia. Whereas, Siloam rental expenses in 2017 is about IDR 192 billion, according to their annual report. Hence, the net rental support by Lippo is approximately IDR 800 billion. It is rather amazing to see rental support being 4x the actual rental, but i guess as Citi has pointed out, Lippo is raising its rental to Siloam hospitals. i didnt know Lippo had healthcare prior to Siloam. Interesting. Hi Ken, I think you did more homework than me on this one. I was a bit puzzled why couldn’t Siloam offload one hospital to First REIT. That would probably benefit Siloam, but it will be tough to extract money out to help Lippo Karawachi. Hence the need for the alternative route. Are all of First Reit Indonesian hospitals being occupied by Siloam? If this is not the case, then the difference of rentals can be explained by rentals paid by third part tenants instead of an income support by LK. Can you explain what does it mean for the increase in trade and receivables? Hi Wong, receivables in this context should be rent from tenants earned but the company have not seen the cash inflow. The question is why there is such a big boost. OUE and Lippo both belongs to Raidy family. 2 brothers each managing one entity. They are playing some games to save Lippo which is in big trouble lately of defaults. Price may drop to $1.10 after XD. If Lippo explode then more trouble for First Reit. The frequent delays in payment had raise an alarm among the savvy and hence the price keep dropping last few months. Doesnt matter what kind of lease the have…nothing is secured. Tqvm for the article n insightful replies. Today 16th Nov d price has dropped to sdg1.11. Hi TK Looi, I have no idea why First REIT fell unfortunately. excellent analysis. UOE group has injected SD 202m into Lippo group which is significant unless the hole is way bigger. the credit risk is with Lippo instead of Siloam. Will First become the next RHT asset sales case ? Some fund investors ie CVCA pump in more money in Siloam to buy First reits assets at fire sale price and after that siloam doest have to worry on the rental and release Lippo on the SGD rental peg. Also the assets can be relist in Indo exchange which was intended last time. Of source sales of major assets subject to approval of First reits shareholders. By selling down share price and buy back more, major shareholders and related parties can potential own much bigger state to vote in favor of the disposal. The above is only a possible scenarios analysis and personal opinion only. Couple weeks slow…. Fool.sg talks about high Trade Receivable which you had wrote. This report is after the stock tanks >15%. Hi RN, are you saying that my article came late?